A packed room of parents, students, teachers, and School Board members filled the Board of Education meeting room on Tuesday, March 19, 2019, with the air of anticipation. On the agenda was the future of a vocation program at Woody Gap School. The school is located at 2331 State Highway 60, Suches, GA and enrolls approximately 75 students from the surrounding area. On the agenda was the topic of the future of Woody Gap’s Mountain Heritage program; Career Technical & Agricultural Education. The program has served many students and helped to obtain employment in various areas such as auto mechanics, agriculture, and woodworking. The school was facing a future without Gary Butler leading the school’s program. He had submitted his resignation effective end of the school year 2019. However, Superintendent John Hill surprised the audience announcing the program would continue as Butler reconsidered and rescinded his resignation. The crowd let out their voice of approval with a round of applause. “Out of the box thinking”, as Lisa Sweet, a local citizen, stated, will continue in the “Valley Above the Clouds”. Hill announced Mark Hughes was promoted as UCS Custodial Supervisor. Hughes has been with the district for many years serving in various vital roles. UCES Early Intervention Program: Sandy Gribble, Barbara Hyatt, Brittany Combs, and Judy Hughes. UCHS State Grand Champion Steer Award went to Bailey Rayfield. Extra Mile Award: Assistant Superintendent David Murphy. Phillip Wright Award: Dr. Daffney Sorrell. Hill mentioned later in the meeting he is confident teacher pay raises will go into effect in 2019. The last such pay raise for these educators was 11 years ago. School teams have worked diligently to build the calendars that follow the Georgia Standards. The calendars provide a timeline for teaching throughout the school year. We are currently working on formatting and plan to make the calendars available on the school website this summer. Math Textbook Adoption: Core math team members from each school have met with company representatives through webinars, face-to-face, or corresponded by email to set up accounts and view programs that have been vetted through research. On Monday, over 30 teachers and administrators attended presentations by two companies. The high school and middle school considered five programs, and the elementary and primary considered four. The core team narrowed the decision to two companies and will now evaluate both programs using a rubric. Members of the team plan to present to the Student Government Teams. We would like to have the decision made so materials can be ordered by early summer. End of Course and Grade Testing: The district is preparing for testing to begin on April 10th. Enrollment: There have been 14 special education transfers to the system since January. We have had 8 early graduates. Our special education population is at a high with 449 students with IEPs enrolled in the system. G.O. IEP (Georgia Online Individualized Education Plan): Union County is in the process of moving toward using the state’s IEP platform for writing IEPs and managing data. This program is offered through the Department of Education and is of no cost to districts. The goal in pursuing this platform is accuracy of data. Data reported in GO comes through Georgia Department of Education (GaDOE) and is updated each January 30th when the Student Record report is submitted to the state. Have purchased two steers from the FFA program for fresh beef. Georgia Grown Event will be held on May 3, 2019 at the Ag Center for Union County Middle School. Lunch will be provided by the school nutrition program featuring school raised beef. Will be purchasing fresh beef from Brasstown Beef. The meet will be delivered directly to the school. Union County joins with four other surrounding counties on bids to increase buying power and to reduce costs. The next Board of Education meeting will be held on April 16, 2019. Timothy Jennings UNG Extension with UCHS State Grand Champion Steer Award winner Bailey Rayfield. Board Member Appreciation: Janna D. Akins, Tony Hunter, Cynthia Odom, Keith Potts, and Patrick White. 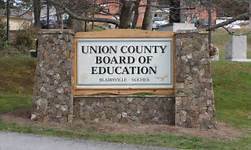 BLAIRSVILLE, Ga. – The Union County Board of Education (BOE) reviewed a tentative budget for the 2018-19 fiscal year during its May 15 meeting. According to Karen Bundy, Union County Schools finance director, the school system will enter the 2018-19 fiscal year with a fund balance of $11,130,345. Revenue projections for the next fiscal year will be $30,749,654 and expenditures are projected to be $30,749,237. This will leave a projected fund balance of $11,130,762 at the end of the 2018-19 fiscal year. Bundy gave a revenue breakdown to the board. State funds will account for approximately 50 percent of the next budget at $15,390,857 and local taxes will account for approximately 47 percent at $14,450,000. According to Bundy, local taxes include real and personal property taxes, ad valorem taxes, and intangible taxes. The remaining amount derives from other local revenue and state grants from the Georgia Department of Education. Regarding expenditures, Bundy stated employee salaries, benefits, and operating costs account for the bulk of expenditures in the budget. She further explained that salaries and benefits alone account for 86 percent of the overall expenditures. Also, Bundy pointed out an amount of $75,000 was allotted for the school resource officer (SRO) added earlier in the meeting for Union County Primary School. During the budget presentation, John Hill, superintendent, and David Murphy, assistant superintendent, presented statistics concerning recent enrollment throughout the district. Murphy stated the school system has been averaging a 1.7 percent per-year increase in enrollment over the past few years, which accounts for an approximate 50-student increase a year. However, the state of Georgia, Murphy explained, has experienced a 5 percent decrease overall, which Hill pointed out was mainly due to the recession of 2008. The board unanimously accepted the tentative budget as submitted. According to Hill, the budget will be publicly advertised in the county’s legal organ and on the school system’s website beginning May 29. On June 19, the BOE is expected to officially adopt the budget. Finally, on June 30, the budget will be transmitted to the Georgia Department of Education. Near the end of the regular session of the meeting, the BOE announced personnel recommendations, which included the promotion of Davenport and Murphy to assistant superintendents. Earlier in the work session, Murphy presented the board with an update of the planned revamp of the school district’s website and communications page. “We want to present an accurate image that’s consistent across the district and provides meaningful information,” Murphy said. Murphy explained the new website will focus heavily on photos, videos, school apps, social media integration, school messenger, and PowerSchool. Hill also pointed out the revamp project will be completed at no cost to the school system. All five principals within the school system presented a State of the Schools update to the BOE. Principal Carol Knight, of Woody Gap School, began the updates by saying the 2017-18 school year had been a year of firsts for the school, which saw Woody Gap’s first cross country team in the fall and the school’s first participation in dual enrollment. Other highlights included the school receiving new playground equipment at the beginning of the year and attending the state capitol after a special invitation from state Senator Steve Gooch. Principal Millie Owenby, of Union County Primary School, reported on the school’s continued improvement in testing scores across kindergarten, first and second grades. Owenby also said five student teachers from Young Harris College assisted at the school during the school year. The school also raised money for hurricane victims in the fall. Owenby also stated the school’s pre-k program continues to grow and remain successful. Principal Patricia Cook, of Union County Elementary School, told of the success of several student-led organizations. Cook explained three students are responsible for regularly raising and lowering the school’s flag at the beginning and end of each day as well as at the onset of inclement weather. The principal stated the school also now has a street safety team of students that helps control traffic on the school’s campus. She also said United Community Bank partnered with the school in managing a school bank for students. Principal Gwen Stafford, of Union County Middle School, stated the school put a heavy focus on writing during the past school year. Stafford said writing assignments dealt with interest-based and career-based projects, such as cooking, law enforcement, health, education and mechanics. Technology integration, the principal said, continues to grow throughout the school as every student is using technology in some way at the middle school. Stafford also congratulated the UCMS boys soccer team, which finished undefeated in the regular season and won its region championship. Principal C.T. Hussion, of Union County High School, reported the school had added a volleyball program and a bass fishing club this school year. Hussion also congratulated the school’s mock trial team, which finished as state runner-up in competition. Regarding the school itself, Hussion stated the school’s C-wing got a building addition during the school year, which was funded by the Education Special Purpose Local Option Sales Tax (ESPLOST). The principal also announced the school will graduate 190 students this year, which is the largest graduating class in school history for the third straight year. Several school recognitions were presented during the regular meeting. UCPS Principal Millie Owenby recognized the school’s cafeteria staff “for going the extra mile.” Owenby told of the cafeteria staff organizing the Pound Puncher weight-loss program at the school in which 371 total pounds had been lost by the school’s staff during the school year. Owenby also recognized Brook Bridges, who, for the third straight year, served as the yearbook sponsor for the school’s yearbook. UCES Principal Patrica Cook presented a school recognition to a group of students from Keri Young’s class who organized a fund-raising support group – Team Ila – in honor of one of their classmates who began cancer treatments during the school year. The group sold Team Ila bracelets and raised over $4,500 to help pay for medical expenses for Ila. “We wanted to let (Ila) know that we care for her and that we have her back,” one of Ila’s classmates explained during the BOE meeting. Principal Cook also explained that Ila is doing well and is now back at school. Also from UCES, the school’s Science Olympiad team was recognized. Cook explained the 20-student team went to the state competition for the second straight year and competed against 63 other schools. Across Georgia, there are 275 Science Olympiad teams overall, according to Cook. During the presentation, the principal also surprised the team by announcing she had just received word earlier in the day that the team finished seventh overall in the state competition. Principal C.T. Hussion, of Union County High School, recognized student Anthony Grader, who Hussion described as an “unbelievable talent.” Grader, a saxophonist, has received a full scholarship to the University of Kentucky to play in that school’s marching band. Principal Carol Knight, of Woody Gap School, recognized student Austin Crowder for finishing third in a building maintenance skills competition. 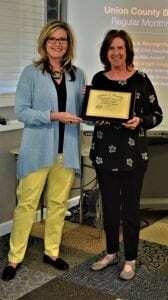 Two Partners in Education Awards were awarded at this month’s meeting. The board recognized Mayor Jim Conley and the city of Blairsville as well as Al Harper and the Blairsville-Union County Chamber of Commerce for both entities willingness to assist and partner with the school system. 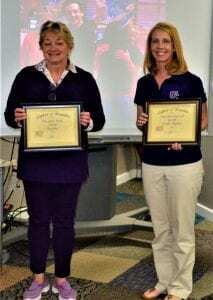 Special education teachers Beth Rouse and Becky Tracy were presented with the Extra Mile Award and the Service Above Self Award, respectively. 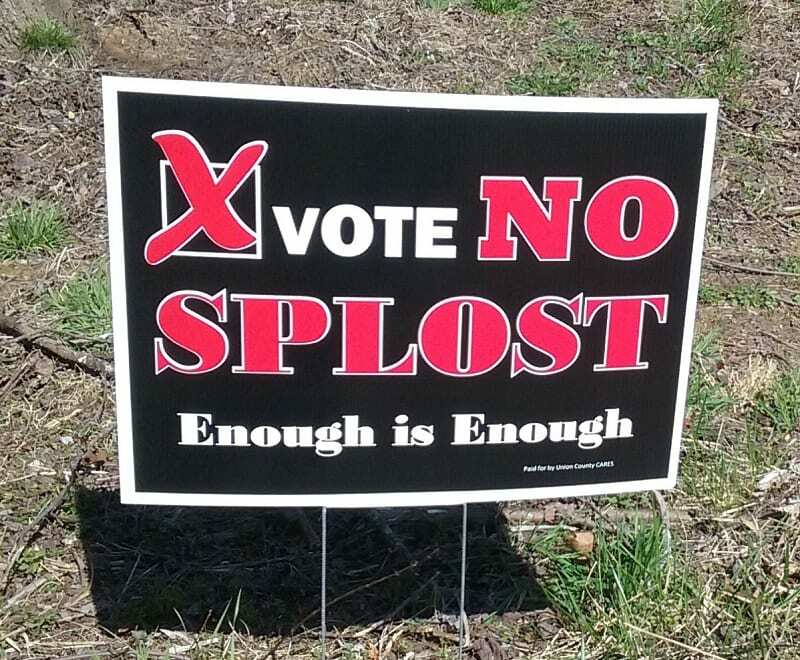 BLAIRSVILLE, Ga. – With the May 22 primary election just weeks away in Union County, the debate over the one-cent Education Special Purpose Local Option Sales Tax (ESPLOST) referendum is growing. ESPLOST is a 1 percent countywide sales tax collected to help fund school improvements. Money generated from ESPLOST can be used for capital projects or to retire debt but cannot be used to pay operating expenses and salaries. A new five-year ESPLOST would take effect July 1, 2018, after the current ESPLOST expires June 30. 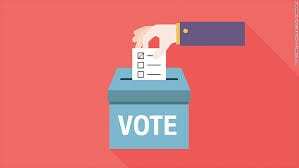 Two groups with two very different viewpoints on the issue have been busy recently in their attempts to persuade voters. Citizens Against Runaway Education Spending (CARES) opposes the ESPLOST referendum while Citizens for Excellence in Education (CEE) supports the referendum. 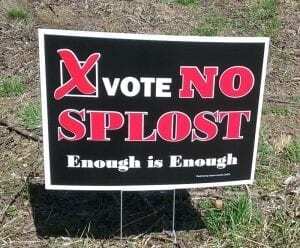 A yard sign, provided by CARES (Citizens Against Runaway Education Spending), urges voters to vote no to the ESPLOST referendum. CARES cites that since the first ESPLOST in Union County was instituted in 1998, the school millage rate has continued to rise, from 8.5 in 1999 to the current rate of 11.78, which accounts for an increase of 38.6 percent. Regarding enrollment in Union County Schools, CARES states Union has seen a 5.3 percent increase while the nearby counties of Lumpkin, White, Gilmer and Towns have all seen double-digit percentage gains. Comparing the 1998 school property tax revenue of $5,037,469 to the 2016 revenue of $16,050,563, Union County experienced an increase of 319 percent, according to CARES, which is a substantially higher increase than that of Lumpkin, White, Gilmer and Towns counties. “This increase in revenue versus school enrollment is excessive when compared to our neighboring counties,” CARES states. Union County High School Fine Arts Center was constructed debt-free with funds generated from ESPLOST. According to CEE, a number of projects have been completed without incurring debt using funds from past ESPLOST revenue, including construction of the Fine Arts Center at Union County High School and the Agriscience Center located on U.S. 129 south, safety and security enhancements throughout the school system, the purchase of cameras for all school buses, the purchase of 10 new school buses, classroom and HVAC upgrades at all schools, and technology upgrades throughout the system. However, CARES argues against the need for continued expansion, questions the transparency of educational spending and states that the county itself is not seeing a direct benefit of its investment in the school system. CARES states, according to its sources, Union County is projected to see only a 4.69 percent increase in school-age (ages 5 to 19) population by 2050 while the 65 and older population is expected to increase by 29.09 percent. Also, CARES claims students suffering from the lack of job opportunities within the county are forced to “either take low-paying, local jobs or move,” and because of this, county taxpayers are not reaping the benefits of educational spending. CEE also states ESPLOST collects from not just property owners but everyone doing business in Union County. “Everyone who shops or stays in Union County pays the sales tax,” CEE states. According to CEE, it is projected that 36 percent of the ESPLOST will be collected from visitors to the county. However, CARES states, according to the Georgia Department of Economic Impact, ESPLOST generated $3,809,047 total in 2015 in Union County and tourists were responsible for 6.7 percent of those total collections. For more information on CARES and the argument against the ESPLOST referendum, visit the organization’s Facebook page at https://www.facebook.com/Union-County-CARES-244353912714137/?ref=br_rs. Next Article » State House Rep. Matt Gurtler: "I threaten the establishment. 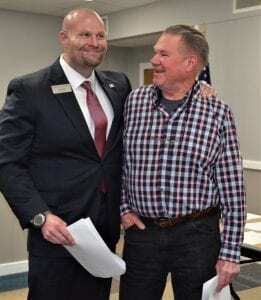 That's just the truth of it"
BLAIRSVILLE, Ga. – Superintendent Dr. John Hill presented a proposal for strategic planning and the Union County Board of Education heard the results of a communication audit at the board’s Tuesday, April 17, meeting. Last month, the board voted to accept the Georgia Vision Project as a guideline of recommendations and suggestions for school boards to follow in updating strategic plans. During Tuesday’s work session, Hill explained that although some programs within the school district are updated annually, the school system’s charter renewal and Southern Association of Colleges and Schools (SACS) accreditation are updated every five years and both are slated to be renewed in the 2018-19 school year. Hill proposed to the board to hire the Georgia School Board Association (GSBA) as a third party entity to assist the school system with updating its strategic plan. Hill also stated the use of a third party to help develop a strategic plan will promote increased honest input from the community and the school system’s stakeholders. Later, in the regular meeting, the BOE unanimously approved the hiring of GSBA to assist with developing an updated strategic plan for the school system. Neither the terms of the hiring nor the cost were disclosed during the meeting. Dr. Paula Davenport, federal programs director and student and staff director, presented the board the results of a communication audit recently conducted by the GSBA. “It’s very important that our school system communicates effectively and that we’re transparent in all that we do,” Davenport stated to the board. Davenport explained a representative from GSBA recently visited the school system and spoke with parents, students, teachers, school leaders, and focus groups while also examining the school system’s website, social media sites, and various paperwork to determine what the school system is “doing well and maybe some things that (it is) not doing well” in its approach to communication. Regarding the reasoning for the communication audit, Davenport stated there were four main goals: to better educate the general public, to improve parent engagement, to build morale internally, and to praise achievements within the school system. The audit, according to Davenport, reported the school system is utilizing social media quite well and especially noted Union County High School’s utilization of social media. As far as improvements suggested to the school system, the audit stated communication in family engagement could be better incorporated into the school system’s mission statement. The audit also stated the school system’s branding is dated and pointed out inconsistencies in fonts and logos on the school system’s website. Also, the results of the audit suggested providing professional training to teachers and school leaders on communicating with parents of students. Josh Davis, Career, Technical and Agriculture Education (CTAE) director of Union County High School (UCHS), recognized welding instructor Derrick Dillinger and four welding students for finishing as runner-up in this year’s Skills USA welding competition. Gerald Bavero, assistant principal and testing coordinator of UCHS, presented eight advanced placement (AP) educators – April Krieger, Deborah Nichols, Teena Atkins, Greg Chambers, Lynn Deweese, Mark Donahue, Alecia Frizzell, and Katie Scott – with certificates of recognition for the state naming UCHS as a 2018 AP Challenge School. “The reason our school performs so well is right here,” Superintendent Hill said of the AP instructors. 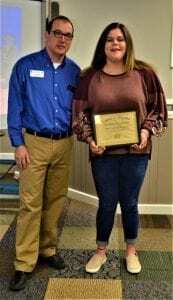 For this month’s Partners in Education award, Davenport presented three nearby colleges with plaques in appreciation of those institutions’ participation in the dual enrollment program in Union County Schools. According to Davenport, during the 2017-18 school year, 161 Union County high school students participated in at least one dual enrollment course. All told, 529 different courses were taken by Union County students at eight different institutions. Davenport also stated that all tuition fees and costs for textbooks are all waived for dual enrollment students, accounting for a savings of $760,400 to students for this school year alone. Davenport presented the Partners in Education awards to Dr. Mark Ivester, president of North Georgia Technical College, Dr. Drew Van Horn, president of Young Harris College, and Sandy Ott, campus administrator of University of North Georgia at Blue Ridge. Tiffany Setzer, assistant special education director, presented special education instructors Carla Drake and Alicia Meng as the first recipients of the Extra Mile and Service Above Self awards, respectively. 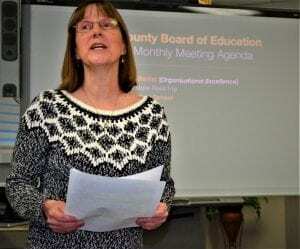 BLAIRSVILLE, Ga. – The Union County Board of Education held its monthly work session and meeting Tuesday evening, March 20. According to Rayfield, among those areas that the project recommends for school systems to include in strategic planning and school improvement plans are early learning and success, teaching and learning, teaching and learning resources, human and organizational capital, governance leadership and accountability, culture, climate and organizational efficiency, and financial resources. Rayfield explained the project’s guidelines will put the school system in good position for its accreditation review next February and also its charter renewal, which will occur near the same time. “This is just a framework we can build on, is that correct?” Board member Tony Hunter asked Rayfield. To this, Rayfield affirmed it was indeed a framework and added that consistency with school systems across the state has been an issue in the past. The board also approved a board member code of ethics and conflict of interest compliance form for its members to sign. Rayfield explained since 2016, the BOE has had in place a code of ethics and conflict of interest policy, which resulted from state legislation. However, the superintendent stated a policy compliance form still needed to be implemented and signed by all BOE members for accreditation purposes. 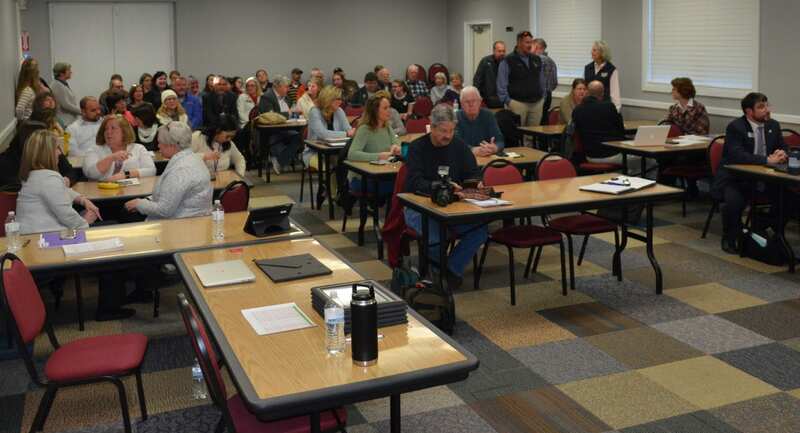 The board also renewed its annual subcontract with Family Connection and the Council on Alcohol and Drugs, Inc.
Several presentations and recognitions were made during the board meeting. The Board of Education itself was recognized and each member given a plaque for Board Appreciation Week, which was last week. 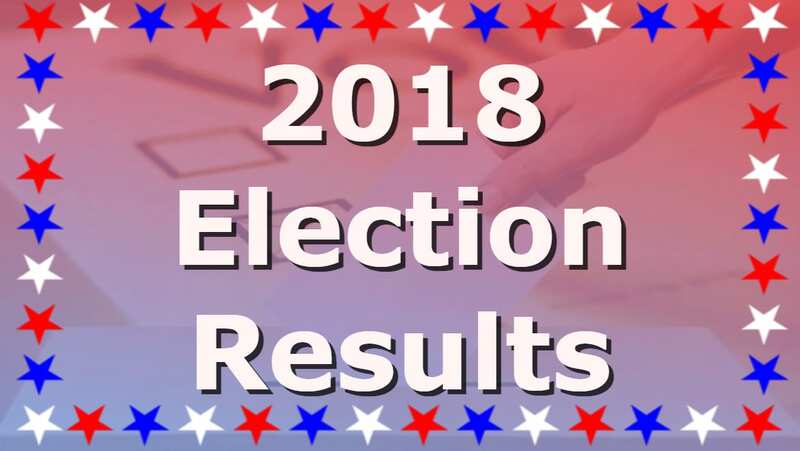 The Board of Education consists of District 1 member Janna Akins, District 2 member Tony Hunter, District 3 member and Chairperson Cynthia Odom, District 4 member Keith Potts and District 5 member and Vice Chairperson Patrick White. Next, Rayfield presented two separate Partner in Education awards to Piedmont College in Demorest, Georgia, and to Blue Ridge Mountain Electric Membership Corporation (BRMEMC). Accepting the award from Piedmont College were Katherine Breithaupt, regional program coordinator, Tim Goss, director of off-campus graduate studies, and Don Gnecco, dean of School of Education. 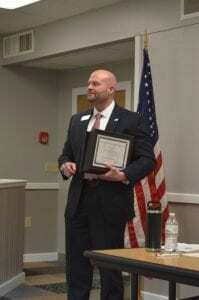 BRMEMC was also recognized with a Partner in Education award. Rayfield explained crews from BRMEMC have helped with various utility issues at schools multiple times, including a Union County High School football game this past season when the field’s lights went off suddenly and crews from BRMEMC were on the scene within minutes. “Many times, when we ask for those things we say (to BRMEMC), ‘Bill us or let us know what that costs,’ and they say, ‘Absolutely not, we’re just glad to do it,'” Rayfield said of BRMEMC willingness to help the school system. Two Union County High School (UCHS) seniors, Emmi Schakat and Cole Wright, were recognized for having been accepted to West Point Military Academy. “Congratulations to these two seniors for an outstanding honor and appointment to one of our military academies,” Rayfield stated. UCHS Principal C.T. Hussion was also on hand to congratulate the high school’s Mock Trial team that recently participated in the state Mock Trial competition. Hussion announced that UCHS won the district for the third straight year. The principal explained unlike sports districts and regions across the state that group schools according to population, mock trial competitions involve schools of all sizes, public or private. “They competed at the highest level, and you should be very proud,” Hussion said of the UCHS Mock Trial team. 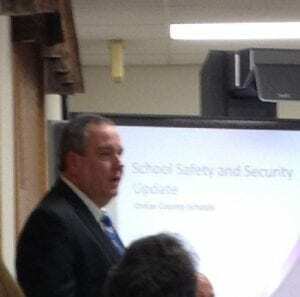 BLAIRSVILLE, Ga. – During the Union County Board of Education (BOE) work session Tuesday, Feb. 20, Dr. Fred Rayfield, superintendent for Union County Schools, delivered an update on school security and safety procedures in the wake of the recent school shooting in Florida. Rayfield stated there are three non-negotiable duties for which all employees of Union County Schools are responsible: teach students, protect students and act ethically and professionally. The superintendent clarified that all security and safety plans and protocols for Union County Schools have been approved by the state and Georgia Emergency Management Agency (GEMA), and Union County has been used as a model for other north Georgia school systems to follow. Dr. Fred Rayfield, superintendent of Union County Schools, updates the Board of Education on school safety and security policies and measures Tuesday, Feb. 20. Currently, according to Rayfield, Union County Schools employ three school resource officers (SROs) from the Union County Sheriff’s Office as well as two security officers and one security guard who mans the guard shack at Union County High School. Additionally, other system-wide safety features include a required picture ID for all school system employees, security cameras inside and outside of facilities, security cameras on buses, thorough visitor sign-in processes, secure “buzz-through” main entry points at facilities, 24/7 monitoring of electronic threats and messages on social media and other online outlets, and on-site panic buttons. Rayfield explained the school system has spent over $715,000 over the last five years on these and other safety enhancements for schools, which averages to $271 a student spent for safety and security measures. Later, in the regular meeting, as the board was about to approve the revision, Rayfield explained this proposed revision must remain tabled for 30 days before final approval can be made to change the policy. In the regular meeting, Superintendent Rayfield awarded two presentations with the first being an art student recognition awarded to second-grader Emma Taylor. Taylor’s design was selected for use on the Union County School System Christmas card in 2017. “Thank you for a beautiful piece of artwork,” Rayfield told Taylor. Next, Rayfield presented representatives from Union General Hospital – Lewis Kelley, chief executive officer, Michael Gay, chief operating officer, and Leslie Daniel, administrative liason – with a Partner in Education award. In other business, the BOE unanimously approved, as submitted, all principals’ quarterly reports, the monthly financial reports, fiscal year 2018 budget amendments, and personnel recommendations.